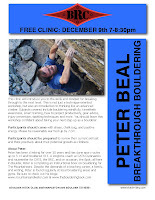 I am very psyched to be offering my first public clinic on bouldering at the Boulder Rock Club next Thursday evening from 7 pm to 8:30. 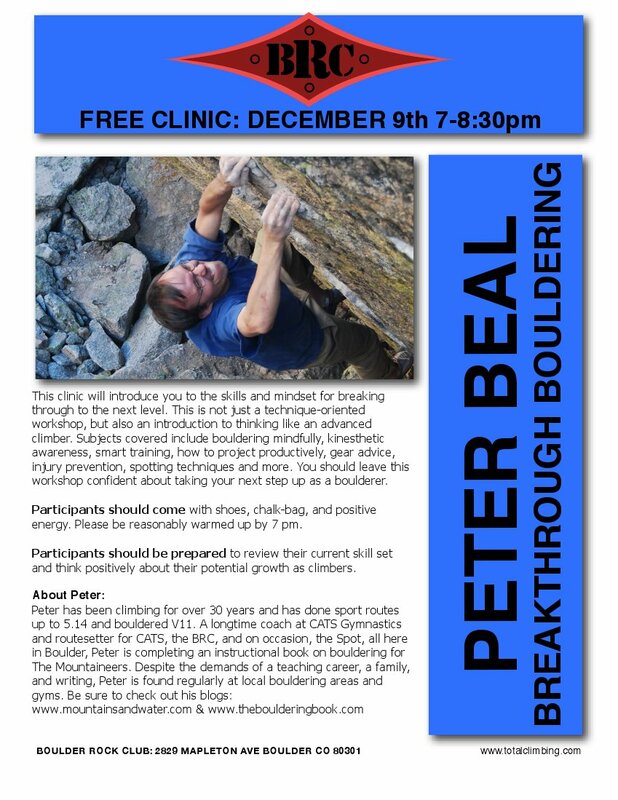 This clinic, titled Breakthrough Bouldering, is intended to help the serious boulderer or roped climber make the next step in proficiency and difficulty. 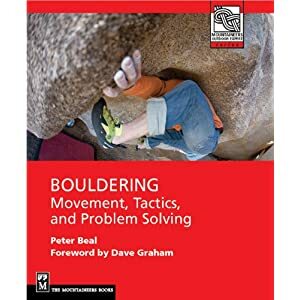 If you are a boulderer who has had trouble getting out of the V2 or V3 grade, I will offer some ideas on how to self-assess and take concrete steps to improve. My primary focus will be on the psychological and mental paths that can be explored in conjunction with better utilization of physical strength, hoping to dissolve the artificial distinction that too many climbers make between the powers of mind and body. I would love to hear how this goes. If you're pleased with the results and would like to host this clinic at R&J, let me know and I'll get it set up. Thanks Amy! I will send you a note outlining the agenda for the clinic. What about for someone trying to break out of the v5/v6 and into the v10s? Think this class would benefit us as well? Thanks. Yes absolutely it would. The main emphasis is to attract serious boulderers who want some direction on getting to the next level. I was lucky enough to go to the clinic, and it was great. Thanks for all the good advice! I thought it was a great balance of on-the-wall work, and mental training. I got some new perspective on trying hard, redefining failure and success, and some great training and technique tips. Groakin - I'm at the same level, trying to break out of the v5/6 grade, and I got a lot out of it. I'd go to another one of these in a heartbeat.